This book is written for people who are fed up with the paltry interest their bank pays on their savings accounts as well as those who are sadly disillusioned with the lackluster performance of their investment advisors. When taxes and inflation are taken into account, the wealth of the vast majority of people is evaporating at a steady rate. If you are one of those people who feel that you may be able to achieve a better rate of return on your own, then this book can help you get started. It assumes no prior knowledge of investing in stock markets and leads you through the steps of managing your own funds. Even if you have some experience, you will find many of the ideas helpful if you are striving to improve your performance. What you need is the basic knowledge and that’s where this book can help you. It tells you how shares are created; how the financial markets operate and how they are regulated. It covers equities, bonds, exchange traded funds, hedge funds and mutual funds. It shows you how to set up a trading account and the basics of fundamental and technical analysis. Different asset classes are covered and an emphasis is placed on asset allocation. You should be warned that investing in stocks is not a slam dunk way to make money. There can be many pitfalls, deceits by unscrupulous stock promoters, bad calls by stock market analysts, economists who got it wrong and of course horrendous market crashes that can wipe out trillions of dollars of wealth during the course of a single day. Emotions certainly play a big role in this battle of fear and greed but if you’ve got the stomach for it, you can make some decent returns. You don’t have to win by much to surpass the paltry interest rates paid on bank savings accounts. And, if your funds are managed by an investment advisor, there’s a good chance that you will be able to achieve a better rate of return by managing your own portfolio. Outside factors such as the sovereign debt, oil prices, politics and terrorism can have dramatic effects on market performance. Also, you have to be alert to the formation of asset bubbles and not to believe everything people tell you. Indeed, this book suggests that you could disregard all the action caused by fear and greed and take a contrarian approach. Finally, this book will provide you with sources of further information and suggests a very painless way to get started before you commit any of your hard-earned money. Chapter 20: Don't Believe Everything People Tell You! Chapter 21: Watch Out for Bubbles! Chapter 22: Think About Becoming a Contrarian! 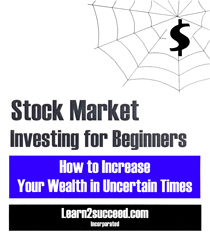 Stock Market Investing for Beginners: How to Increase Your Wealth in Uncertain Times by: Learn2succeed.com Incorporated: Softcover; 164 pages; ISBN: 978-1-55270-446-2 published in 2012; $24.95.